Your union’s leadership includes committees and depends on teamwork to accomplish our goals. As with most organizations, your union’s leadership includes committees and teams that work to accomplish many tasks. Feel like contributing to your union? Check out the committees below and see what strikes your fancy. Then contact us. We can always use more help! 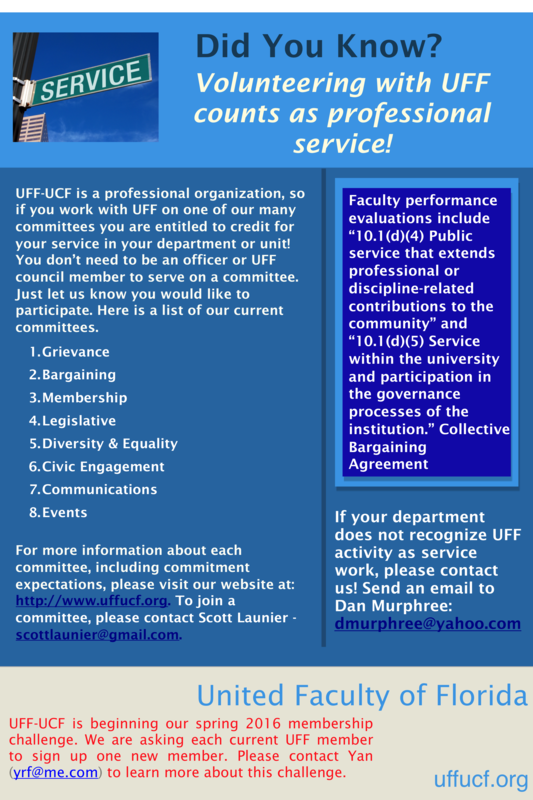 And remember: UFF is a professional organization, so work you do for UFF should count toward your service commitment. The Grievance Team, CHAIR: Ashley Salter (CDL). Be willing to read and become familiar with the Collective Bargaining Agreement (CBA). No memorization necessary! Attend grievance-related meetings as an observer first, and when comfortable, as an active participant. Members of the Grievance team are expected to commit at least 2 hours a month to meeting with faculty and helping evaluate if their concerns are grievable or not. Read and respond when necessary to a weekly update from the Grievance Committee chair. This generally will consist of a summary of recent activity, special issues to be aware of, and general grievance education tips that should benefit all. Meet at a monthly lunch or dinner hosted by the grievance chair (and paid for by UFF) to update one another, review what has been learned, and project next steps. The Bargaining Caucus Team, CHAIR: Jen Sandoval (Communications). Read periodic updates from the bargaining chair. This could include current status, but maybe more of a quick informational, education moment for the team. Meet at a monthly lunch or dinner hosted by the bargaining chair (and paid for by UFF) to update each other, review what has been learned, and project next steps. The Bargaining Research Team:, CHAIR:Jen Sandoval (Communications). The Membership Team, CHAIR: Yan Fernandez (Physics). Do 3-4 hours of office visits, or have 6-8 conversations with faculty in office visits, per month during the fall and spring semesters (Sep, Oct, Jan, Feb, Mar). Visit some current members to build a relationship, and thereby identify and encourage new activists. Visit some non-members to build a relationship, and thereby start a conversation that would eventually hopefully convince the non-member to join. Send a brief summary of your office visits, including name and issues discussed, every week to the membership committee chair. Read (and if necessary reply to) a weekly update from the membership chair. This could include current status, but maybe more of a quick informational, education moment for the team. Meet at a monthly lunch or dinner or coffee hosted by the chair (and paid for by UFF) to update each other, review what has been learned, and project next steps. The Legislative Committee, CHAIR: TBD. The Diversity & Equality Committee, CHAIRS: Stephanie Wheeler (Writing & Rhetoric) and Nick Shrubsole (Philosophy). The Diversity and Equality Committee shall study, disseminate information and make recommendations to improve the status of the university constituency. The Civic Engagement Committee, CHAIR: TBD. The Communications Committee, CHAIR: TBD. Develop portfolio of UFF materials, including logos, handouts, etc. The Events Committee, CHAIR: Keith Folse (Modern Languages & Literature). Committee descriptions are as of Spring 2016.